- Sora and his buddies have just returned to Traverse Town with the last navi gummi in hand. After they give it to Cid to install, Sora suddenly falls into a very deep sleep. He soon finds himself back on the Destiny Islands, just the way they were before the Heartless attacked. Only, it’s far too quiet and he can’t see the mainland. He can’t even summon the Keyblade anymore. He can’t any friends anywhere except one: Kairi. But, there’s just something different about her… Completed August 14, 2009. - The 3YE has put Blue and Red on a mission. The empire has built a new machine on one of the moons and they hope to use this machine to shrink Earth down so they can conquer it with little ease. However, due to much ruckus and battling, the machine starts to go a little haywire, and Colonel Orange isn’t making things better by punching it... Completed September 8, 2006. - Getting all trained up for the final battle against the Fourth-Dimensional Being; Luther. Fayt and his party are battling monsters out on the open fields of Aquaria. Peppita asks Maria a question about her powers to make the party stronger and to test to see if it works, Fayt allows Maria to test on him. As a result, Fayt gets reduced to three inches tall and then Maria gets kidnapped by unknown group of people. Its up to the men to save Maria as the women look after the shrunken Fayt. Completed January 8, 2010. - Part of EmmaGear's 1 Hour Story series. Bad Girl is the second ranked Assassin in the UAA, and is known for (among other things) being rather skilled with a wooden baseball bat. Even in her off time she enjoys killing men in leather masks and has accumulated a rather large amount of corpses in the stadium. But just how many masked men lie behind the small hole in the wall they come out of, and how exactly are they all stored in what is likely a limited space? As you've probably guessed, space isn't much of an issue when the victims are mere inches high. Completed February 26, 2010. - Ten years ago, in the city of Twin Seeds, Claris and Elliot were two teenagers who had dreams of one day making it big. Today, Claris and Elliot are both around 22 years old and have been good friends since the defeat of Wizeman. They are both out Christmas shopping when they see people pushing and shoving to get that last hot item. Claris feels this is damaging to the Christmas spirit and wishes there was something they could do. At the same time, Elliot keeps promising Claris that he'll get a beautiful Christmas present when he can't even afford it. So it shouldn't be surprising that the two soon find their way back in Nightopia, telling their stories to the NiGHTS... Completed December 24, 2005. - The streets of Tokyo-to are somewhat safer today with the GG's having disbanded nearly every last one of their rival clans, but with the team having more members than ever before, now any time there is trouble on the streets, it's likely because the GG's have been there. But what happened late one evening was anything but troublesome. Gum and Mew, who had become close friends in recent years, take a pleasure grind through the city until they end up in an abandoned power plant. The curiousity gets the better of the girls as they go inside to discover some very strange spray cans that they had never seen before. Once they get their hands on these spray cans that are filled with a mysterious chemical substance... well, let's just say the whole city is in for a more large-scale mess. Completed June 6, 2005. - Hugo Andore and pink-haired (and female as of this writing) Poison have been the most commited duo to ever grace the rough streets of Metro City. But lately, Poison's been frustrated because her job has always been manager, while Hugo took care of all the fighting (as well as protecting her countless times). She's NEVER had the power to take matters into her own hands. That's all about to change though when Poison falls into a strange chemical which changes her body very slowly. Soon, she'll inherit the title of "BIGGEST FIGHTER" in all of Metro City. Completed August 4, 2006. - A week has passed since three Rumble Roses contestants were mysteriously knocked out (Reiko, Dixie, and Candy Cane), but all three girls continue on with their lives, in their home countries, as if nothing happened. However, without any kind of warning, all three girls grow to hundreds of feet tall each, big enough to trample through whole city blocks in seconds. Each of their different personalities dictates the fates of major cities in Texas of the United States, Quebec in Canada, and of course, Tokyo in Japan. Reiko tries to be as gentle as she possibly can, Dixie brings a Yeeee Haw kind of personality to the Lone Star State, and Candy acts like the big bad girl she always was in elementary school, only of course much bigger. Meanwhile, the unknown force behind the mega growth of these ladies watches from a totally seperate location, loving every minute of the worldwide destruction... Completed August 21, 2009. - When a mysterious part is attached to Chase's Robo, He is forcebly merged and shrunken with it and must find a way to return to normal. Now it is up to Marcia to protect Chase and stop Eliza and Isabella from shrinking the whole world! But who is the mysterious man following the duo and what are he planning? Completed April 16, 2010. - Coco's latest invention causes some big problems for her, can Crash figure out a way to fix things before they get out of hand, or will Crash be stuck with a big little sister. Completed November 17, 2017. - The N-Team arrives in Kongoland to find Donkey Kong one furiously mad creature! He's been going around smashing and bashing even the most beloved of Kongoland attractions out of some kind of frustration. Luckily, the team is able to discover the reason... it seems DK has been feeling quite lonely as the only giant being in town, and the team feels they should find a soulmate to calm him down. The problem is... there's no other giant to be found anywhere in Kongoland. That's when Dr. Right, along for the ride, offers the solution. He has created a special program that can increase the size of anyone. Princess Lana immediately volunteers thinking she's the right person to calm DK down. So after growing and matching DK's size inch-for-inch, Lana is successful in getting DK back to good spirits. Only one problem... because Dr. Right hadn't perfected the antidote yet, Lana will have to stay huge for 24 hours! So when it becomes the day to live with DK, who knows what can happen? Completed March 2, 2007. - Part of EmmaGear's 1 Hour Story series. Ayame is given an order to deliver divine punishment to a corrupt official staying in a nearby inn. In laymens terms, find and kill a man who has done evil. Ayame's done it a million times, and now it needs to be done again. It's almost to the point of tedium, especially since the inn the evil man is staying at is one she's infiltrated before. Though she is happy that security will likely be tighter for this exact reason, she takes some special smoke bombs along with her anyway. These particular smoke bombs are among her most prized possessions, because they make disposing of a body much easier than conventional methods. Completed February 26, 2010. - This story includes Cubed Cinder's original character, Princess Apple, and is used with permission. It's been some time since Celica witnessed Princess Apple's giantess army turn the tide in the battle for Aytolis, and she's now been crowned queen of the unified continent of Valentia. But much work must be done to stabilize the nascent kingdom, and sometimes she and Alm still can't quite see eye-to-eye. And sometimes, in the wake of Mila and Duma's passing, Celica laments how she can't do more for the people, that she can't live up to the image of a reincarnated Mila many believe her to be. Then one day, Valentia gets an unexpected visit from Princess Apple, aiming to give Celica a taste of what she missed out on before. Will Celica take this opportunity, and if so, how will she use it? Last modified April 5, 2019. - Like any guy out there, Ken, a software engineer for the South Korean government, has a crush on the beautiful, professional eSports player Hana Song (AKA D.Va). Luckily for him, he has the opportunity to program her mechanical drone, called MEKA. Upon seeing the drone work as it should, Song thanks Ken by inviting him over. Ken’s visits became regular, and sooner or later, he’s going to have to reveal his macrophilia fetish. And he actually knows how to do it by implementing some code into the MEKA. Will Song grant him his personal desire? Completed August 27, 2016. - After the destruction of Halo 04, the UNSC Marines, led by the Spartan II soldier Master Chief, begin a campaign on the Covenant occupied world of Jiantto. After being deployed to the surface, MC and his Marines scout the area, and have a run in with a Covenant squad. The battle mostly goes in favor of the Marines, until a group of Covenant Wraiths shows up. In the resulting confusion, Master Chief becomes seperated from his Marines. After wandering for a while, MC's A.I. program, Cortana, begins sensing a data construct nearby. Master Chief finds it, and uploads Cortana. Cortana starts downloading data, which contains details of what the Covenant is doing on Jiantto. However, something happens and Cortana downloads too much data, causing her to malfunction. The data tower explodes, knocking out Master Chief for a little while. When Chief comes to his senses, he finds Cortana standing in front of him, but there's something different about her... Completed July 21, 2005. - Doctor Faust makes a pact with the devil for a potion that will enhance the strength of any Gear by ten fold. However, the fiend tells him never to give it to a female gear. Faust is not careful with his warnings, and it gets splashed about everywhere. Too bad for the cursed doctor--his sins just quadrupled in size! Completed February 8, 2008. - While travelling to the remains of the Air Castle to retrieve the Eclipse Torch, Rune Walsh recalls the events from 2000 years ago, when the legendary heroine Alis Landale liberated the Algo star system. Before Alis and her party faced off against the tyrant Lassic, they were forced to make a detour, thrusting her into an adventure that would make her realize there was more to her fight than merely personal revenge. Completed March 23, 2007. - 100 people packed into a bus, being forced to battle to the death! It seems like a normal game, until one Teknique finds a strange Green Potion. After chugging it down, she grows to a ginormous new size! With this new power, Teknique's only goal is to take over the island, and maybe even grow a bit bigger too.. Completed August 17, 2018. - Inspired by a drawing from Final7Darkness. Banjo and Kazooie are left bruised and battered, clearing the way for Gruntilda to steal Tooty's beauty and become the beautiest in all the world. Of course, Gruntilda feels it's not enough as now she wants the power to rule over as much of the world as she pleases. Mumbo Jumbo, pledging his eternal loyalty to the witch, offers up the perfect solution. With the help of as many Glowbos as he can fish out of his hut, MJ uses his Enlarge spell to make Gruntilda grow, and grow, and grow, and grow. 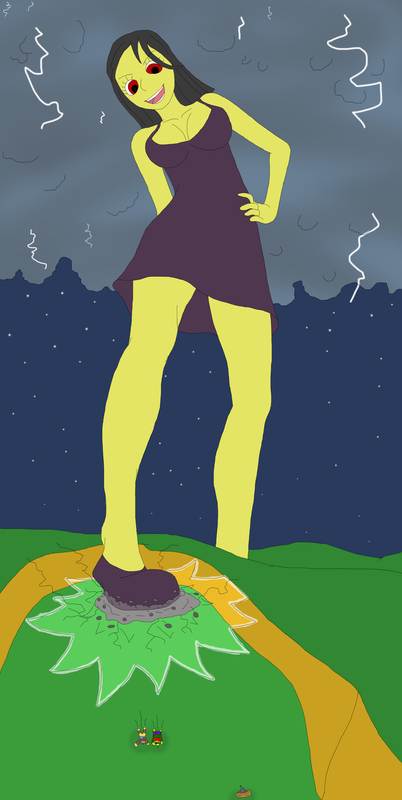 The beautiful witch now stands 360 feet tall, immediately testing her power on Banjo's home with Banjo, Kazooie, Tooty, and Bottles all barely able to escape. Meanwhile, Gruntilda walks around the land, visiting places like Mumbo's Mountain, Treasure Trove Cove, and many others (including the Isle o' Hags), showing the world not only who is the most beautiful, but also who is large and in charge... Completed October 1, 2016. - Dr. James Marcus has died and the facility where he performed his unwordly experiments is nothing more than a smouldering crater. However, Rebecca Chambers has an uneasy feeling when a stray zombie nearly kills her. Therefore, she checks the wreckage to find out where it came from. Her curiousity nearly gets her killed when she finds a secret lab far beneath the surface, built to withstand the self-destruct sequence of the facility. The lab contains a terrifying creature, produced by Dr. Marcus before his encounter with Rebecca and Billy. Billy saves her life, but cannot stop her from being infected. The two of them escape from the beast with their lives. Instead of dying, Rebecca's body expands bigger and bigger... Completed July 8, 2005. - It's Linda's birthday again in her huge castle, and Linda knows that every year, Slash and the other boys come in uninvited and mess up the party. She even remembers last year when they completely ruined the entire area by doing a snowboard race through the entire castle! While Nancy and Pamela try to cheer her up, Wendy pulls out something that will turn the tables on the boys. Seeing what it is, Linda knows that it's finally time to teach the boys, mostly Slash, a lesson... Completed February 8, 2014. - The evil twin of Lammy, Rammy now wants to once and for all get rid of Lammy so she can be called, the best guitarist ever. Only problem is, the hip-hop loving puppy is the only one standing in her way to destroy Lammy. So what does Rammy do? Well she steals PaRappa's dad "Denoodleizer" and shrinks PaRappa's dad! Later that day, PaRappa was on his way to having a date with Sunny Funny, his love. But Rammy sort of crashes the party and shrinks PaRappa and herself! What's even worst is, Sunny doesn't know about any of this! So will PaRappa and Rammy team up to be noticed by the giant Sunny Funny? Also for no reason whatsoever, PJ Berri finds out about VGGTS! Completed April 23, 2010. - Everyone gets his or her inspiration from somewhere. BlazingBarrager? He gets them from his dreams. Sure it’s not a flashy inspiration location, but tell that to Lewis Carroll who wrote a famous book with GTS scenes off a simple tale he told some kids. Yeah, dreams are a great for a load of stuff, but he would never have guessed that one of his dreams would actually become reality, and that he would end up on the wrong side of it. This is his tale... Completed June 15, 2007. - Jay McFadden was driving home when he gets involved in a car accident. None other than Elise, Marisol, and Zoe are the ones driving the car that forces Jay off the road. When the girls go to see if he is okay, they find a quite irate Jay McFadden, who goes a bit too far in his rage and shoves them to the ground in disgust. However, before he can apologize, he shrinks and finds himself at their mercy. Completed April 4, 2003. - After saving the world from despair, Makoto Naegi feels like the trouble is over… or so he thinks. One moment, a nonchalant Kyoko Kirigiri gives him a cup of coffee. The next, he shrunk to at least 5 inches tall. Obsessed with the new size of Naegi, Kyoko plays Giantess with the shrunken boy. Things only get worse when Komaru Naegi enters the scene and joins the fun as well. Can Makoto survive the torture of his giant friend and “big” sister? Completed March 27, 2019. - The armed recon robot named Quote finally overcame the evil Doctor and his magical sidekick, Misery. However, just as Quote vaporizes the Doctor he jeopardizes the island by simultaneously destroying the core of the island! The island begins to fall to the surface of the Earth, with both the inhabitants of the island and the people below the island about to die. However, Misery doesn’t die with the Doctor, and she stops the calamity by casting a stabilizing spell on the core. Misery takes this opportunity to cast a spell on Quote that will greatly affect his life expectancy. The world is saved, but what will happen when the savior must save himself? Completed January 14, 2011. - Another new day awaits Roxas as he has been given his day's mission which is to locate and destroy a powerful Heartless whom has been looming around Wonderland. Roxas has been partnered with Xion whom the two are very happy about. Once they have been sent to Wonderland, Roxas shows Xion the Bizarre Room, which has the size changing potions. Roxas took a gulp of the shrinking potion which leaves him three inches tall and before Xion could drink from it; the potions vanished by a black blur. Leaving both Roxas small and Xion normal height all the way through Wonderland as they search for the missing potions. Completed June 18, 2010. - Prince Marth of Altea is leading his rapidly expanding army into the Fane of Raman, where he wishes to find the Starsphere and Lightsphere for the sage Gotoh. However, within the Fane lies a dragonkin named Tiki, who has the powers of a divine dragon. She is under the dark control of the dark warlock Gharnef. Gharnef decides to cast a spell on Tiki in an attempt to decimate the Altean League. What spell does Gharnef cast upon the little dragoness? Read the story to find out! Completed April 29, 2011. - Luke Triton had moved away from London over a year ago now. He and his friend Hershel Layton had kept in touch the whole time. They had planned for Luke to come over for a month during the summer. Luke’s father approved, and the two planned a date to meet again. Neither one knew just what kind of trouble was chasing them this time, as an old foe rears their head once again. Completed August 25, 2017. - Kite receives a message from his online friend, Mistral, telling him about a another secure area in The World. After agreeing to go through with it, Kite decides to join her. But this area in unlike anything they've ever seen. It's up to them to uncover its secret, with the help of Kite's skills and Mistral mysterious new spell. But will that be enough? Completed June 16, 2006. - Some time has passed since DJ Octavio was stopped and trapped in a snow globe, but Octavio is one of those villains that has a backup plan in case things went south, and today just so happened to be when the plan would, literally, surface. With an upcoming Splatfest quickly approaching (Team VGGTS vs. Team ACGTS), a few of the arenas the Inklings compete on start secreting a weird type of grey ink that hasn't been seen before, so Callie and Marie are tasked to report on the subject on Inkopolis News. After closing off one of the arenas for the broadcast, and with the grey ink right behind them, Callie and Marie report on the mysterious ink that started appearing in the many arenas and talk about if it might hinder the upcoming Splatfest, but just as they were about to wrap things up, the two slip on the wet floor and fall into the grey ink. Surprisingly, the grey ink doesn't cover them in its grey color, but instead causes them to grow into massive giantesses and become playful and destructive. Will the Inkling Boys and Girls of the teams figure out how to shrink the Squid Sisters before they destroy all of Inkopolis? Completed January 20, 2017. - Two years after the Grey Ink Incident, that same mysterious ink that made Callie and Marie grow is back. The tiny sampling picked up back then was enough to set DJ Octavio's escape plan in motion. Four giant Octoling Girls suddenly show up in Octo Valley and easily break him out. The four evil giantesses next arrive in Inkopolis, not only wrecking the place but covering it in their ink. Marie knows right away the cause of the Octolings' growth. After risking her life to get some grey ink and recruiting four Inkling Girls to cover them with, it becomes the ultimate Turf War in the city to stop the Octolings from spreading their evil further. Meanwhile, a familiar face wearing shades watches from afar… Completed November 9, 2017. - While Simon is patiently waiting for his partner, Lara Croft, to search for an ancient necklace, he suddenly jumps when something big appears and crushes the temple. It turns out to be Lara Croft, wearing the mystical necklace, and it appears the powers of the necklace have turned her into a giantess. What does Lara do next with her new size? Find out in this story. Completed December 26, 2000. - The Black Hole Army is on the verge on using a new invention created by high-minded scientists. Sam, Andy, and Max are sent on a mission to destroy this invention whatever it does. However, during the raid, things start to have a…tactical error. Completed November 24, 2006. - In the race to help the galaxy from the threat of the Reapers, the Normandy receive a strange signal. Thinking that it may be a SOS signal, Shepard, takes Tali, Liara, and EDI with him to the source of the signal. Upon discovering that the source of the signal is coming from a large cargo ship, they also discover that the owner of the ship is a quarian, name Zisa, whose on her pilgrimage. As it turns out, the quarian is performing a experiment where she not only made a size device, but also is planning to use geths to as a way to help improve her people's weak immune system. Hearing this, Tali offers to be the one to try it under the condition that Zisa and Shepard shrinks themselves and enter her body to make sure everything is ok. With that, the geths, Shepard and Zisa are injected inside Tali. Everything seems to work, but there are always risks of something going horribly wrong in experiments. Completed December 21, 2018. - Reinhardt Schneider looked at the door of his next tower. All it said was Tower of Giants. So he entered, knowing that something big was waiting for him, but he falls unconscious upon entering. When he awakens, he sees everything bigger than it was before he entered the room, including the vampiress dressed up as one of Dracula's maids. Reinhardt decides to hide until his partner, Carrie, arrives and comes to his rescue. But with the maid already spotting the tiny vampire hunter, it may be too late. Completed February 9, 2001. - Tekken Tag Tournament is about to go through Mega Mushroom Mayhem (Madness was already taken by another storywriter). In the Mushroom Kingdom, Toad and Toadette are readying another supply of various mushrooms for Mario & Luigi to use in their next adventure. But an accident causes them to lose their containers full of items, mostly mushrooms, down a warp pipe. While the two rush back to Peach's Castle to deliver the bad news, all sorts of size-changing silliness ensues around the 'real world.' In Japan, young Asuka Kazama finds her fellow Tekken female competitors Ling Xiaoyu and Miharu Hirano shrunken after they touched poison mushrooms thinking they were super mushrooms. In Brazil, Christie Monteiro decides to have some fun with random shrinking men (including of course Eddy Gordo). In France, the entire country goes bananas trying to dodge a 1500-foot-tall Emilie de Rochefort (aka Lili) after she decided to play around with a Mega Mushroom. And finally, in the United States, Julia Chang and her mother, Michelle, become giantesses during their trip to Las Vegas. I'm serious... don't read this if you have zero sense of humor. Completed March 9, 2013. - Set shortly before the events of the first game, Maya decides to pay a visit to her older sister, Mia. After meeting each other again the two continue their way to have some burgers while Maya decides to show off some of the cool new things that her aunt, Morgan, has taught her. Humoring Maya, Mia agrees to see if her spiritual powers have improved any since they last met. Much to Mia's surprise, they have, and even more surprising is the shrinking that goes along with Maya's display. Mia is now at her younger sister's control until the cause of the shrinking can be figured out. Completed February 26, 2010. - Out of 16 exhibition matches, Kim Wu has lost every single one of them, leaving her fans criticizing her for not fighting very well. Kim Wu decides to retreat to a mountain getaway (not far from her dojo) to get her mind off all the criticism and all the lost fights. While there, she finds a seemingly abondoned potion shop and looks for a potion that could enhance her fighting ability. The shopkeeper offers Kim Wu a red potion, but when she takes it, hoping it will improve her fighting ability, the potion causes Kim to grow into a 100-foot-tall giantess! See what happens to the city of Ultratech when the giant Kim Wu rolls into town. Completed September 8, 2002.